xUnit.net is a testing framework that can be used to write automated tests for .NET (full) framework and also .NET Core. 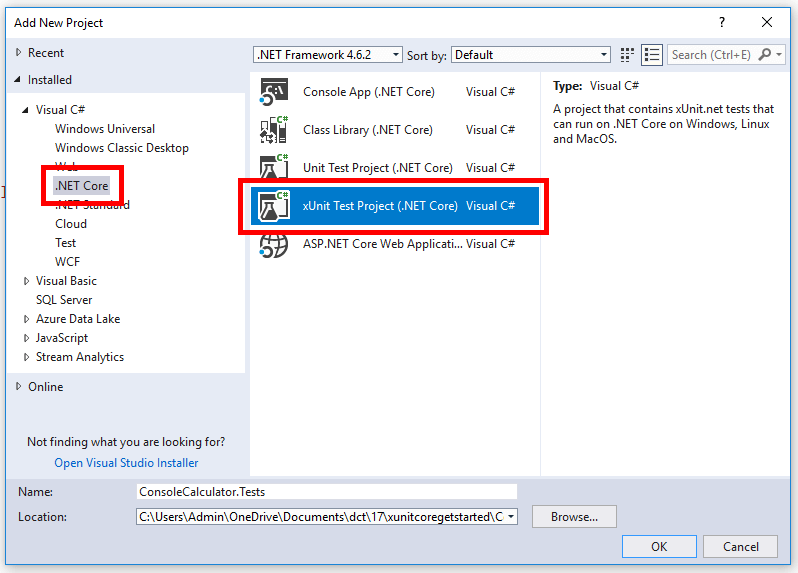 To get started, first create a .NET Core application, in the following example a .NET Core console app. This test project will come pre-configured with the relevant NuGet packages installed to start writing test code, though you may want to update the pre-configured packages to the newest NuGet versions. Notice in the preceding code, the Test1 method is decorated with the [Fact] attribute. This is an xUnit.net attribute that tells a test runner that it should execute the method, treat it as a test, and report on if the test passed or not. Next add a project reference from the test project to the project that contains the code that is to be tested, this gives the test project access to the production code. 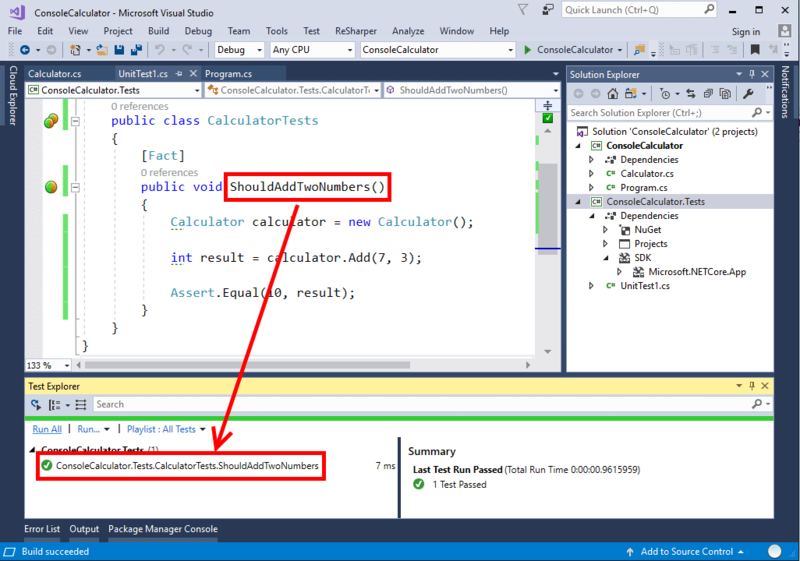 In the preceding code, once again the [Fact] attribute is being used, then the thing being tested is created (the Calculator class instance). The next step is to perform some kind of action on the thing being tested, in this example calling the Add method. The final step is to signal to the test runner if the test has passed or not, this is done by using one of the many xUnit.net Assert methods; in the preceding code the Assert.Equal method is being used. The first parameter is the expected value of 10, the second parameter is the actual value produced by the code being tested. So if result is 10 the test will pass, otherwise it will fail. To learn more about how to get started testing .NET Core code check out my Testing .NET Core Code with xUnit.net: Getting Started Pluralsight course or check out the docs. It’s often useful to take a step back and look at the bigger picture, this is true in different aspects of life such as health or wealth or relationships, and is also true of software development. When it comes to creating automated tests (as with other aspects of software development) dogmatism and absolutist schools of though can exist. As with all things, the decision to write tests (and how many tests, what type of tests, test coverage aims, etc.) ultimately should boil down to one question: do they add value to what you are doing? To be clear, I absolutely believe in the creation of automated tests in many cases, however it is good to not be dogmatic. For example if there is a niche market that is ripe for capitalizing on, and time-to-market is the most important thing to capture this market, then an extensive suite of automated tests may slow down getting to that initial release. This of course assumes that the potential market will have some tolerance for software defects. It also depends on what the product is; medical life-critical software is probably going to have a higher quality requirement than a social media app for example. This can be a trade-off however with shorter term delivery speeds being quicker but at the expense of delivery speed in the long term, if you’re overwhelmed fixing production outages you have very little time to add new features/value. Another aspect to consider is that of risk. What are the risks associated with defects in the software making their way into production? Different features/application areas may also have different risk profiles; for example the “share on social media” feature may not be deemed as important as a working shopping cart. It’s also important to remember that risk is not just monetary, in the previous example a broken “share on social media” feature may bring the business into disrepute, aka “reputational risk”. When it comes to the myriad of different types of tests (unit, integration, subcutaneous, etc.) the testing pyramid is an oft-quoted model of how many of each type of tests to have in the test suite. While the testing pyramid may be of great help for someone new to automated testing to help them learn and navigate their initial steps, as experience grows the model may no longer be optimal to some of the projects that are being worked on. Beyond the testing pyramid the different aspects of test types can be considered such as execution speed, breadth/depth, reliability/brittleness etc. Automated tests also do not exist in and of themselves, they are part of a bigger set of processes/considerations such as pair programming, code reviews, good management, well-understood requirements, good environment management/DevOps, etc. If you want to take a step back and look at the big picture, or know a developer or manager who wants to understand the trade-offs/benefits check out my Testing Automation: The Big Picture Pluralsight course. My latest Pluralsight course is now available for viewing. 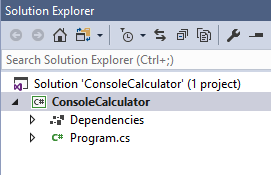 It demonstrates how to use the Scientist.NET library to execute candidate code in production alongside the existing production code. This allows the new candidate code to be additionally verified as able to work in production (for example with production data that may be of variable quality) and offers an additional check in addition to automated tests that have been executed in the development/QA environment. You can check out the new course here.